Açai extract, papaya extract, mango oil, coconut oil, and wheat proteins nourish and moisturize hair while the ammonia-free formula permanently tones your hair two to three shades lighter in under 30 minutes. Amplify your hair with Color Charm's fade-resistant toning formula. It penetrates hair, saturating and fusing it in order to deliver top notch color. The formula is ultra-light so it doesn't damage your hair, instead leaving it vibrant and lustrous. Tone your hair in under five minutes with Pravana's ammonia-free formula. 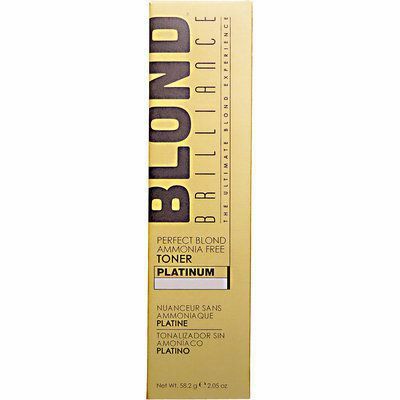 You can use this toner with any shade to maximize your blonde—it even works especially well on bright, pastel tones. Boost flaxen color with L'Oréal's ultra-affordable hair-reviving treatment. This formula neutralizes any unwanted brassiness while nourishing processed hair, giving life and movement back into your strands. John Freida's formula is designed to keep your hair as blonde as possible for as long as possible. The six-in-one treatment eliminates any brassiness and yellow tones in hair, leaving it cool-toned and bright. Apply it to wet hair and leave on for about a minute two or three times a week for the best results. Achieving the whitest platinum blonde is now possible with Manic Panic's violet-based toner. It erases all yellow tones in the hair and leaves it looking as icy as you intended. Unlike most purple toners, this offering is also marketed to be used before dying your hair to create a fun pale violet pastel color (but of course, you can still use it as a rinse-out toner to boost your blonde). Along with ridding your hair of any yellowing and discoloration, this toner makes color-treated hair more manageable and reverses damage by using a natural blue cypress oil formula. The oil will restore and renew hair without leaving it greasy, making it easy to leave it in your hair until your next wash. Illuminate and intensify the color of your hair by using this deep-conditioning treatment in 20 minutes or less. DPHue's treatment makes hair more vibrant and fresh than before while leaving a glossy finish sure to be a source of envy. Applying this mask will rid your hair of dreaded bleach-induced damage and will enhance the dimensions of your hair, leaving it as blonde and bright as the day you walked out of the salon. Want to know more about the best treatments for your hair? Read all about our favorite keratin products here.